After a successful initial run over the summer, the Jazz Arts Group’s Jazz Academy has announced the Fall 2015 installment of the Columbus Community Jazz Band. Targeted at those with past experience playing an instrument and looking “to get back in the swing of things,” the CCJB will meet at the Jazz Academy (on the 4th floor of the Lincoln Theatre complex) on Thursday evenings, October 15th through November 19th, from 7:30 to 9pm, with an Open Jam from 6:30 to 7:30pm. There will be chances to perform and record, and this session of the band will be led by local legend Vaughn Wiester! If you’re interested in playing your horn again, this is your chance! Registration ends on October 12th – Click here for more info. Friday, October 2nd: Radarhill and Small Songs at Carabar. This persistent Olde Towne East live music venue is hosting two consecutive nights of live jazz this week. After local cinematic fusion adventurers Descendre play Thursday night, an intriguing lineup of various styles will take the stage Friday night. The show will be headlined by local alternative jazz quintet Radarhill, who are going through a lineup change. Trumpeter Nick Simko is out of town for a few months, but trombonist and composer Nick Weckman has joined the group in his stead, bringing different colors to the outfit. Weckman will remain with the group when Simko returns, so be ready for a front line of serious power (also including saxophonist Jordan Reed) in the future! Saxophonist Alex Burgoyne’s Small Songs project opens the night, with an ensemble cast playing free jazz compositions based on tunes that started in Burgoyne’s piano lessons for young students. The second set will feature dioses serpientes enroscados, a brand-new local “drone folk” trio. No cover! Sunday, October 4th (2pm – 5pm): All Star Band at the Makoy Center, Hilliard. The Central Ohio Hot Jazz Society, dedicated to the preservation of Classic/Traditional Jazz, kicks off its 2015-16 season with a swingin’ one-time-only performance featuring many local trad jazz greats. The lineup includes: Chris Moore, cornet; Erik Greiffenhagen, clarinet & baritone sax; Sally Lukasik, trumpet; Joe Lukasik, clarinet; Vaughn Wiester, trombone; Larry Nusser, piano; Sid Townsend, tuba & string bass; Gus Ross, drums; and Bob Butters, trombone. Admission is $15 for COHJS members (memberships available at the door! ), $20 for non-members, and $10 for dance club members & college students. 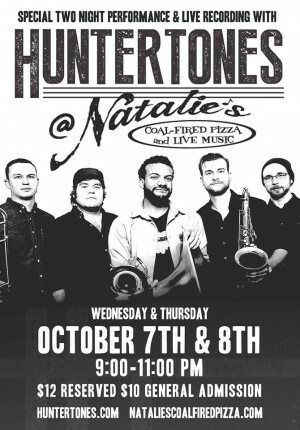 Wednesday, October 7th and Thursday, October 8th (9pm – 11pm each night): Huntertones Live Recording at Natalie’s. This locally-founded, Brooklyn-based horn-driven powerhouse returns home to start an eleven-day Midwestern jaunt. This special two-night performance will be recorded for a future live album and live concert videos. The group is preparing to release a new studio EP on November 20th, so this will also be a great chance to hear their new tunes before you can buy them. Advance tickets are $10-$12 and available here (Wednesday) and here (Thursday). Buy your tickets now if you don’t already have them, and welcome the boys back to town!